The Beaverton Round Executive Suites is Beaverton’s most exclusive full service, premium-quality business facility. Offering the finest office space and services in Beaverton, Oregon, The Beaverton Round Executive Suites is a one stop shop for the office professional looking for premium office space that includes the best in service, style, culture and location, at an affordable price. The Beaverton Round Executive Suites have an environment that makes going to the office pleasant and professional. Located at The Round in Beaverton at the Beaverton Central Max Station, the Beaverton Round Executive Suites offer busy professionals convenient access to every conceivable amenity at surprisingly affordable rates. With a variety of services and amenities close to the office, the Beaverton Round Executive Suites are ideal. 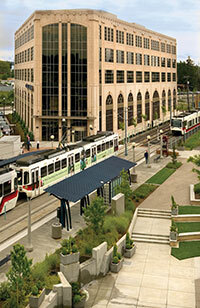 Office Space – The Beaverton Round Executive Suites offer premium-quality executive offices and suites, as well a full compliment of business support services at a convenient location just steps from the Beaverton Central MAX station. Virtual Office Packages — Don’t need a fulltime office? A Virtual Office Package might be the right solution for you. Ideal for home based or small businesses that wish to present a professional image, but do not require physical office space. Meeting Rooms — Our executive conference rooms and training center can meet all your casual and professional business needs accommodating groups from 2 – 85 people. Location — The Beaverton Round Executive Suites offices are conveniently located to provide access to every conceivable amenity. Amenities — Within the Executive Suites, around the Beaverton Round Campus or within the area, a variety of amenities are offered. Contact Us — Contact us with any questions you might have or to arrange a tour of our offices.